Thank you to my amazing brother-in-law who always keeps me real, it has been 187 days (now 188) since my last entry. I mean, it is called project ART A DAY, right? What's wrong with me? As my title states and as I mentioned in that post, I am rethinking the way I teach. Now, this isn't a total rethinking so much as a philosophical thinking. I know what you are thinking, "What the hell does that mean?" I think it means that I have a style of teaching, that evolves and shifts depending on my students, and that I believe that my style has always been a little bit TAB-ish without calling it that, or even realizing it had a name. 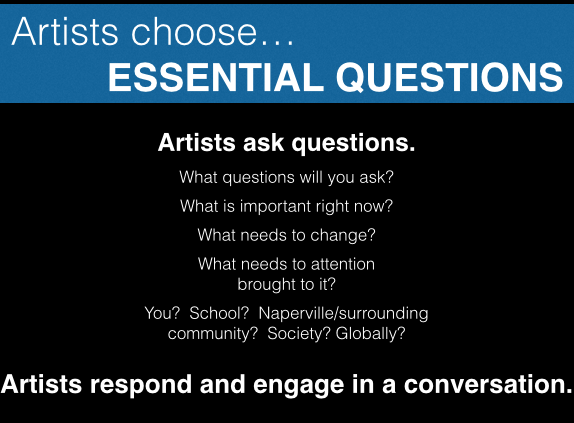 My process has changed a little from the above after working with my music counterparts on... how to create a more cohesive language for the entire fine arts department. 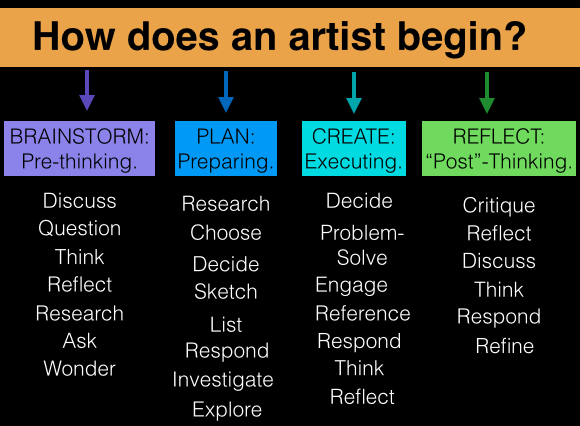 This makes the artistic process EXPLICIT to the students, and demonstrates how many "words" move fluidly within that process. 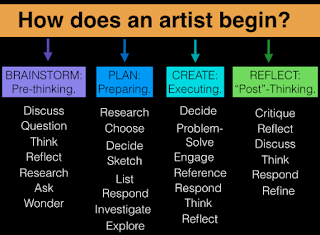 I also want to preempt this conversation and say that I also STRONGLY believe in teaching the "Artistic Process" of Plan, Create, Critique/Refine, and Reflect (again, can be another post), and I believe that this goes hand in hand with TAB (not the same as TAB, but is necessary to discuss and understand or question art). I think that I'm working currently on wrapping my head around what this all looks like for me and my students (because I also believe that changes depending on your "clientele"), as well as MAKING IT EXPLICIT in my classrooms. So here goes trying to explain my journey in a nutshell. 1. I might not be Nik Wallenda, but...: I wouldn't say I'm all in or all out. 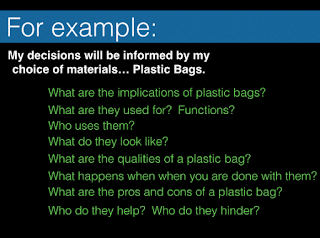 I'm teetering with my toes in each pool thinking about how my students still need tools in their toolbox through very process oriented projects (that is not to say that the outcomes look the same, so much as there are very specific expectations to fulfill to demonstrate to me that the students are "getting" it). I feel like if I just give my class "free reign" then their art may or may not turn out like crap. Only because many of them just don't have "tools in their toolbox" to help them succeed. 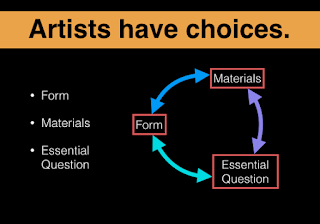 The beginning of a PPT in Sculpture on Artistic Behavior. 1.5 Free for all is a free-for-all? : I also wonder along those lines, how we have students who are so used to being told what to do, how to succeed (ie get that grade), that they don't know how to handle the "free reign" quite yet. I feel like easing them into this process is more successful (for me). 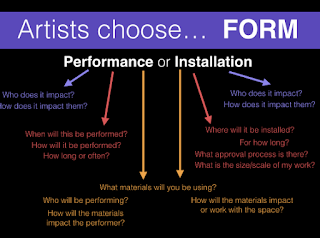 On a tangent, (as I usually do) I said to my sculpture class (who are currently my guinea pigs for this process), "My rubric that you see for this first assignment looks differently than my usual rubric, as many of you know me. I'm really thinking about never grading again. What do you think of that?" And the students said, "Wait, what? So, everyone gets an A?" or "So, if we hand it in on time, we get an A?" They just are so wrapped up in a society of grading, that they aren't truly creating for creation/art sake. I feel like in my classes, they are getting steps closer to that, but still ultimately want to know what they can do to get an A. It's a bit painful... but I also wonder, so how DO I grade them (as I'm required to). That's another post. 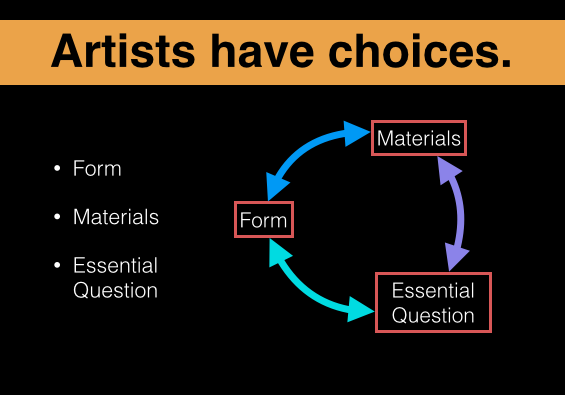 An example from that PPT about how artists make choices. 2. Thinking deeper: I love the idea of pushing my students to think deeper. I typically suggest ideas and say, "now you don't have to do that. There are a million ways to accomplish your goal. I'm just throwing out ideas to get you to think outside the box." But, are they really THINKING deeper? And is that okay? Because I'm still giving them skills to think beyond the expectations (which most of our students are driven by... "here's the expectation, so you can get an A." 3. Back on the grading wagon: I hate the idea of a grade. I really do. 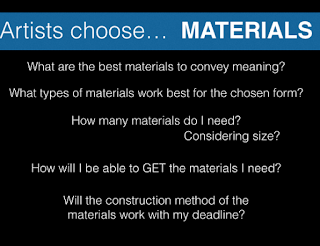 I do believe that students should be able to demonstrate concepts just like in any class, to receive the marks. However, I also believe that some things you just can't measure like that. For instance... risk taking, connections to life, EFFORT (omg, how do you measure and quantify effort... really? ), participation (wow, I have come up with rubrics upon rubrics and honestly, I just can't stay consistent with that to keep it up). I do fully admit that that was more like 10 things crammed into the space of 5.5, but I can't help it. I'm not so neat and tidy as I'd like to be. Plus, this is a blog, not a research paper, for crying out loud! 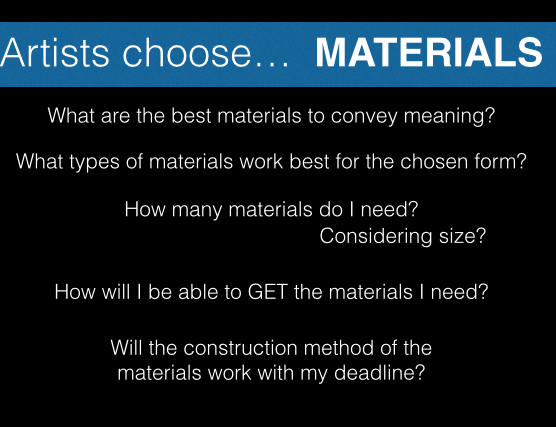 Example of how artists choose materials. 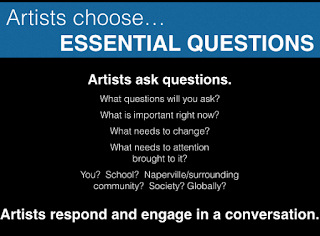 Another example of how artists ask questions. And then I show them an example of how when an artist chooses the material, how then essential question and form follow along. 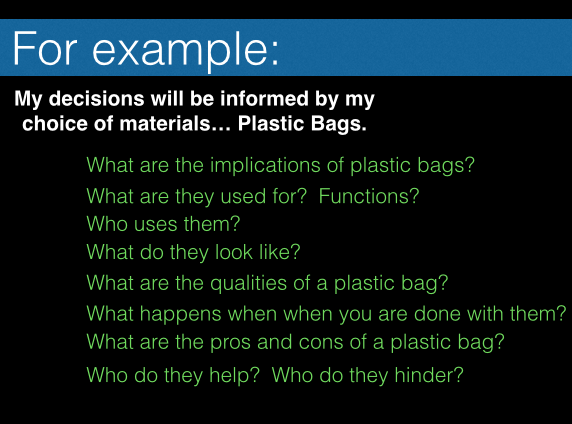 I then show many slides of different types of forms created with plastic bags. Came back to your blog; great to read your thoughts as I contemplate the same concepts in my classroom. Thanks for the post!